Guinea is a former French colony in Africa, and tourism is not something that holds the country’s economy. There are not many hotels outside the capital city, but wherever you go in Guinea, you will find lovely people ready to take you in and show you around. Guinea has a coastline along the Atlantic, so sitting on the beach in the sun is an option if that is what you like to do. However, it would be a pity to go to Guinea and not explore the culture. There used to be many tribes, which is why the museums display all kinds of masks. Music is one of the people’s favorite pastimes, and you will not be able to relax your feet once you feel the rhythm. Guinea may be a country where people may not have many riches, but they are rich in culture and goodwill. You will have an unforgettable experience. Before you start planning your vacation in Guinea, you should see whether you need a visa or not. According to Guinea’s visa policy, the citizens of 21 countries and jurisdictions can enter Guinea and remain inside the country for up to 90 days. Visas on arrival are also available, but unfortunately, the only people who qualify for one are the citizens of the United Arab Emirates. All the other nationalities must visit the nearest diplomatic mission of Guinea and apply for their visa there. It is easy to find out if you need a visa or not. 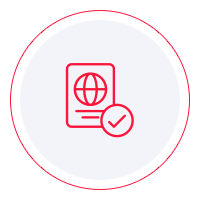 You could take a quick peek at Guinea’s visa policy and check to see whether your country is on the list of visa-exempt states or not. However, what we propose is a much easier solution. You can use iVisa’s Visa Checker. It is a simple tool, and you can find it in the top right corner. All you are required to do is select your country of origin from the drag-down menu and put Guinea as your destination. If you do not need a visa, lucky for you. If you do, you will be given a list of the embassies you can use to apply. iVisa cannot process visa applications for Guinea since electronic visas are not available for this country. However, we would still like to help you in any way that we can, which is why our support service is available to you 24/7. You do not have to pay for information. just give us a call. If it turns out that you need a visa to visit Guinea, you must do your homework on the requirements. They may be available online, but we recommend that you call the issuing authority itself. It is the most reliable source of information. Websites are not always brought up to date, and that can lead to errors. Just give them a call, and you will find out what you need to know. Nevertheless, what we can tell you is that you need a passport that remains valid for at least another 6 months from the date of arrival in Guinea. For further information, contact the nearest diplomatic mission of Guinea.